Tank of the month? Wasn't I gleefully admiring a tank with just a bunch of rock and some sand in it only a few months ago while my family and friends wondered what the heck I was so excited about? 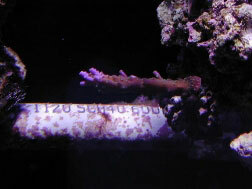 It seems that way, but it was actually April of 2000 when I set up my reef tank. 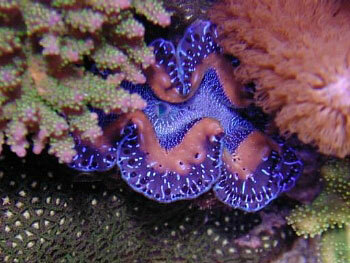 The colors on the live rock, the glow of actinic lighting, my first beautiful Aiptasia... so much to look at! As I smiled at my pile of rocks, I knew that I was hooked on reefkeeping before I ever got my first coral. 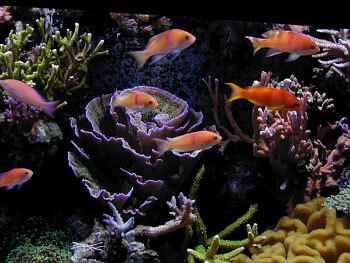 I started keeping freshwater fish in 1974 and progressed to saltwater fish in 1975. 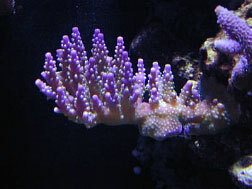 After many years of keeping fish I started researching reef tanks. 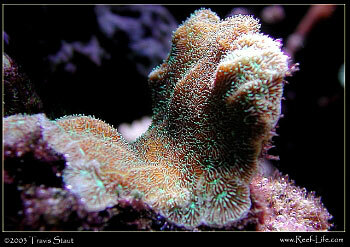 My work schedule had not allowed me to devote the time it takes for a reef prior to then, but now I was ready! 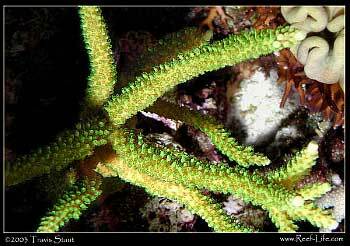 I had not discovered the still young Reef Central at that time, but I did find Bob Fenner's Wet Web Media site and bought a couple of good beginner's books. 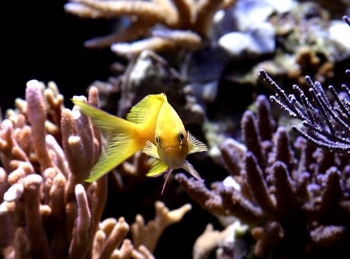 I approached my endeavor as if I had never even seen a saltwater tank before, which was likely a good idea since my most recent saltwater book before that time was written in 1973. I knew there had to be some new developments since then! I started with the basics and learned everything I could before I put my game plan into operation. I bought a 55-gallon aquarium to use as a quarantine tank. I got it running and stable. Then, after much thought, I decided to go with an acrylic tank instead of glass for my reef. After five months of research and excitement I was filling my soon-to-be saltwater obsession with its first drops of water. 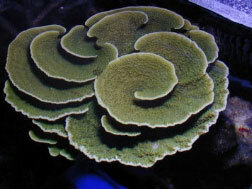 I kept soft corals and some large polyped corals only for the first year, but then the SPS bug got me! 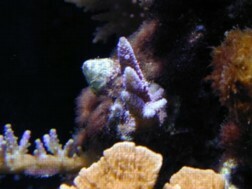 As the stony corals started filling the tank, the soft corals started disappearing, although I do have a few soft corals that I could not bear to part with and are still in my reef to this day. 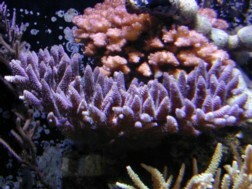 I like the combination of the SPS colors combined with the gentle swaying of other corals. 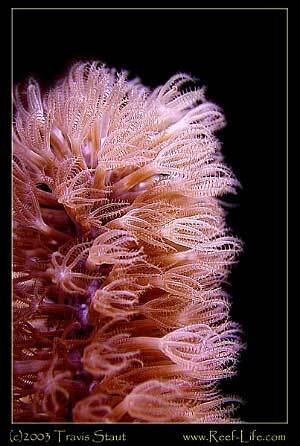 Coral movement quickly gets the attention of those of us not lucky enough to be addicted to this hobby and serves to pique their interest. 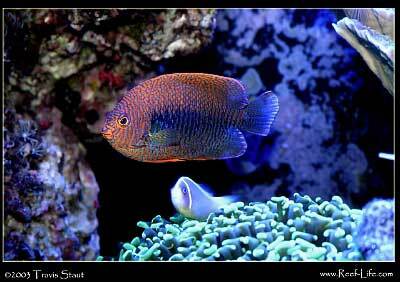 I look at a mixed tank as a little something for everyone... although I am an SPS junkie at heart! For lighting my reef, I use a Giesemann 260 pendant system with two 250-watt Ushio double-ended bulbs, and two 42-watt Osram normal output actinic bulbs. I have yet to see anything that comes close to Giesemann as far as the quality of workmanship, and have been more than pleased with the HQIs. The unit is heavy and strong, the polished paint finish is equal to that of a new vehicle, and the mechanism for raising and lowering the system is simple and dependable. This lighting provides my reef with a fairly natural shallow water appearance. Growth under HQI lighting is known to be excellent, and my results have shown that to be true. I would like to have a slightly bluer look, so I am currently weighing the possibility of adding either one 5-foot VHO actinic, or two 5-foot T-5 actinics. Because of the location of my aquarium I was limited to keeping most of my equipment under the tank. When I decided to add a refugium to an under-the-tank-mess already at capacity, it was going to take some major remodeling. I moved my chiller outside of the cabinet (which REALLY needed to be done anyway!) and recruited the help of my fix anything/figure out anything/ build anything brother-in-law Rick Beauregard (aka Rickeejb on Reef Central) to help me design something feasible. How to make room for a minimum 25 gallon sump to handle an in-sump skimmer, a return pump, a dual chamber calcium reactor, a CO2 tank, a ballast, and an "as large as possible" refugium in an 18"x 67" space? Pictured below is what we came up with. It is a DIY project built by Rick. We were able to squeeze 33 gallons of capacity into the refugium. 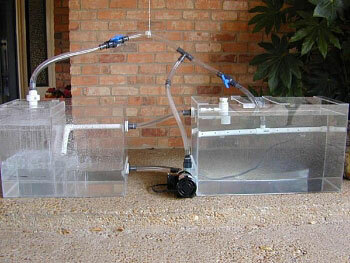 The overflow sends water to a "T" fitting with valves to adjust the flow to the sump and refugium. Water to the sump side falls through a drip plate and over several inches of rock to help reduce micro-bubbles, then proceeds through an "over-under-over" set of baffles to further reduce the chance of bubbles entering the tank. After all of the baffling, there is just enough room left for an in-sump skimmer. Water flows from the other side of the "T" coming from the overflow into the refugium, which contains four inches of coral sand. Chaetomorpha macroalgae is used for nutrient export, and an assortment of sand and water critters make their home here. 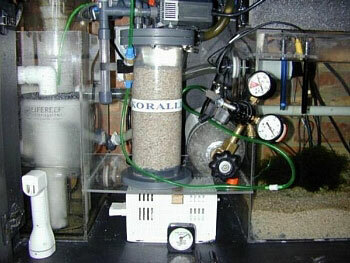 Water near the top of the refugium overflows through a bulkhead and into a piece of 3/4 inch tubing which gravity feeds to the far end of the sump. On the cabinet floor between the sump and refugium sit my ballast and return pump. 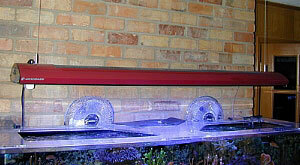 A slide-in shelf mounts just above the pump and ballast and holds my calcium reactor and CO2 tank. All-in-all, I think it's a pretty efficient space management project! For skimming I use a Lifereef SVS-24 protein skimmer. It does a good job with an absolute minimal amount of maintenance. I also employ the full time use of carbon and a PolyFilter. There is always some question of chemical warfare in reef tanks, especially in a mixed environment, so I take out the extra insurance of using both of these. If nothing else, at least I can feel better about things in my own mind! As things progressed I found myself constantly upgrading the circulation in my reef. I started with three Maxijet 1200s when I was keeping soft corals only, and since have slowly inched forward to six Maxijet 1200 powerheads controlled by a Red Sea Wavemaker and one Tunze 7410 powerhead with a Tunze controller. This, combined with a GRI 518 return pump, now results in a water turnover rate in excess of 3000 gallons per hour, which translates to about 24 times per hour. The interior walls of the tank are cleaned every two days with an acrylic-safe pad. I tried using magnets, but the thought of getting a piece of sand stuck between the magnet and the acrylic was too risky for my taste! I am a strict believer in doing regular water changes, and 15-20 gallons of water is replaced every two weeks. I change out a bag of Black Diamond carbon once a week and put in a fresh PolyFilter® once a month. On occasion, I will run a bag of Chemi-Pure for a week. The skimmer cup is cleaned as needed, which usually is about once per week. 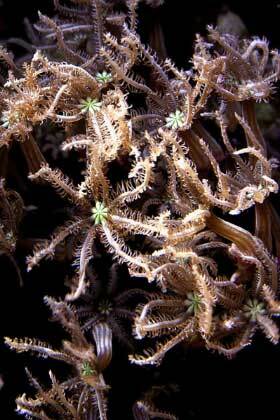 The refugium macroalgae is pruned, on average, once every three weeks. 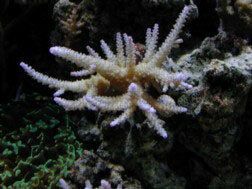 Fragging has also become what I consider "regular maintenance" due to corals growing into each other. 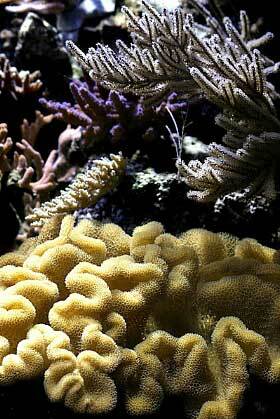 Often, I let them fight it out, depending on what my experience has been with the individual corals involved. 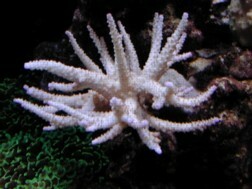 All too often, my fragging has been "accidental" maintenance! The fish are fed three cubes once daily of assorted frozen foods; additionally, once or twice per week I will feed OSI flake food or Tetra® Nature's Delica Whole Bloodworms gel. 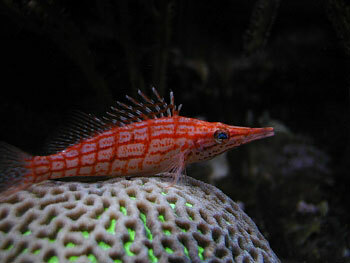 Every other day I feed Seaweed Selects, which every fish in the tank loves to see! I add Selcon once weekly with my feeding. 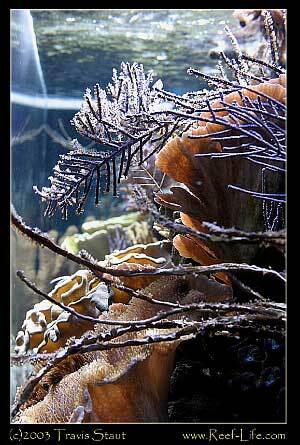 The tank is fed twice weekly with phytoplankton, and on average, every ten days with Golden Pearls. I also feed a piece of fresh shrimp once or twice a week for bristleworms, Nassarius snails, and whatever else might decide to partake. 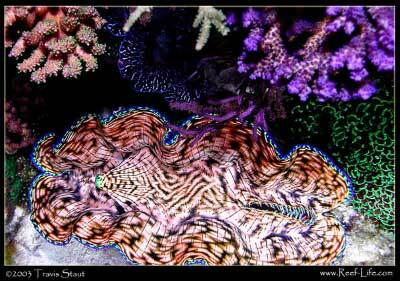 My reef is dominated by SPS, along with a few LPS, soft corals, clams, and fish. 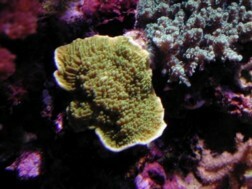 All but one of my SPS corals started as small frags. 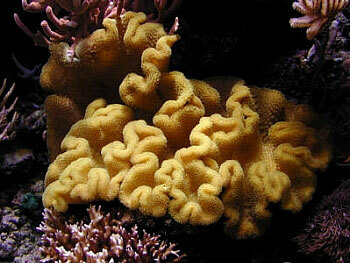 I have tried five or six various wild colonies, and all but one were summoned to coral heaven within a year. 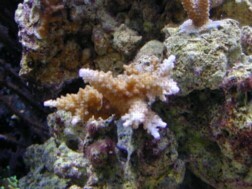 I have lost only one or two captive-raised SPS frags since I began keeping them. Watching corals grow and develop from small frags is near the top of my "favorite things" list in this addiction that we refer to as a hobby. What color will they end up as? What shape will they take on? At what speed will they grow? 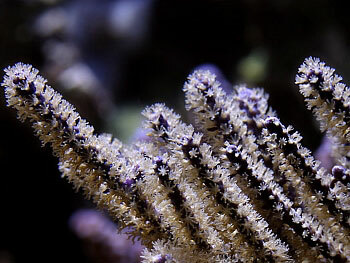 These things are also true of many wild corals, but there is something special about seeing a two-inch fragment grow into a fine looking colony that makes reefkeeping even more special than it already is. When it comes to stocking, I have never had the "hurry up and fill the tank" attitude. It has been a slow, careful process for me. I now have a few decent size pieces mixed with some medium-sized colonies, and a few fairly small corals that have been added within the last few months. 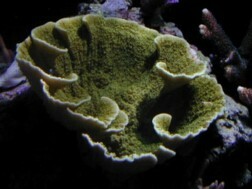 Some frags were obtained from retailers such as Greg Hiller, Dr. Mac, Inland Aquatics, and Steve Tyree. 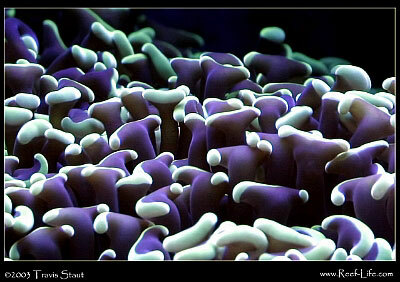 A great many more have come from trading with fellow reefers, and these are the corals I value the most. Some of the great folks I have traded with include Dave (Nanook), George (Griss), Vic (trailertrash), John Moffett, and Rick (Rickeejb). While I do not have much room to add many more corals to my tank these days, I have enjoyed sending frags to several other friends that I have made here on Reef Central. 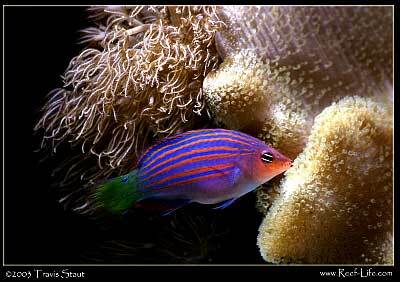 Spreading the joy is certainly one of my favorite facets of reefkeeping!! 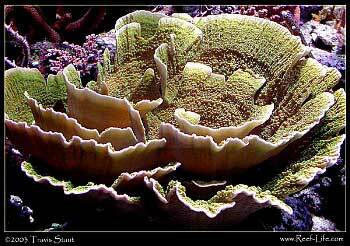 While I love the shapes and colors of SPS, there is a certain allure to the soft corals that causes me to want a few of them in my reef. 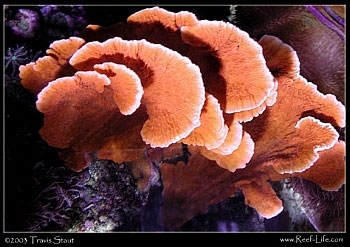 The gorgonians swaying in the current, the gentle curves of a leather coral, and the feathery polyps of a pipe organ coral all add a striking visual contrast to my SPS tank. 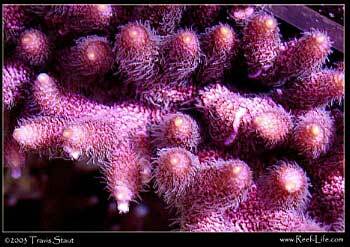 When I see a coral growth sequence thread on Reef Central or on a website it immediately gets my attention. There is nothing I enjoy more than checking out the progression of growth that fellow reefers achieve with their corals. 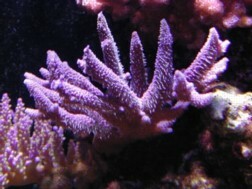 Picture taking has been part of my reefing routine over the last two years. 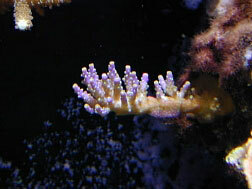 Reviewing coral pictures to see what a coral looked like a year or two before can often catch you by surprise, and I find it a very rewarding part of the hobby. Over the last three plus years, reefkeeping has been an important part of my life. I always attempt to learn about an animal before I bring it home, research a piece of equipment before I buy it, and take care of my critters to the best of my ability. At the same time, I strive to keep it simple. I don't jump up and try every new idea or product that comes along. I stay with what has worked for me to this point, which is a slow, progressive, and careful building of a tiny piece of a reef. I want to take a minute to thank a few people who have been a great help to me. I guess I should start with my wife and daughter, who constantly attempt to hide from me when they know I need to take the canopy off of the tank for ease of working in it. They amuse me when they laugh while watching me look through the refractometer, or look for color changes when checking my alkalinity. They refer to me as "the aquarium nerd." Special thanks go out to my brother-in-law Rick, who put in many hours of work on DIY projects for me, and to Travis Staut at reef-life.com for taking some of the great pictures you see here. 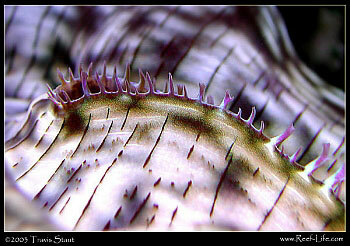 Also, to Cheri Phillips (Reef Cherie), who went way beyond what I expected in rebuilding my website for me. And, of course, a handful of the original Reef Central members (there weren't all that many of us back then) that helped me out tremendously when I was first cranking things up. Oh yes... and the strange guy at Fintique in San Antonio back in '74 that didn't want to sell me a neon tetra until I knew what my pH was! I would, of course, like to thank Reef Central for bestowing this great honor upon me. I look at all of the fantastic reef tanks featured previously, and I'm thrilled to be considered in the same class with some of these amazing boxes of beauty. I guess this proves that with lots of research, some hard work, lots of tenacity, plenty of time, and maybe even a little luck thrown in, anyone can take their pile of rocks and build a living work of art from them. While looking at fish, corals, and equipment in person and on the boards is something that never gets old, what I have most enjoyed is all of the good friends I have made over the last three years - several of whom I talk to weekly. You know who you are... stop denying it!! Click on the button below to visit Steve's website for more information on this tank.